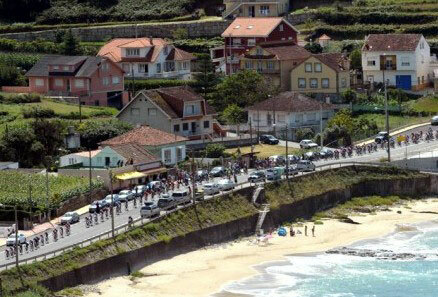 If you are a cyclist and you want to know a little bit more about Asturias you are in the right place. Stages 14, 15 and 16 are the legs of the 2012 Vuelta that will see the race enter and pass through this Spanish region and the mountainous nature of this region means that there will be plenty of severe hills climbs, but also some of the most stunning scenery imaginable. For those following the last few days of the 2012 Vuelta, many may have been surprised at the scenery found in neighbouring Galicia and the greenness and lushness of this will continue as the cyclists move through to Asturias. Both of these Spanish provinces lie to the north of Portugal in the top western corner of Spain and they have a very different, milder and wetter climate than the rest of the country. That said, there is currently a heat wave in the area, so the cyclists will get little rest bite over the next few days. As the prominence of many Spanish cyclists suggest, the sport in road racing form is very popular in Spain and the vast roadside crowds are an indication of the profile that cycling has nationwide. There are many reasons for this that range from the climate to lower levels of general vehicular traffic, but the high quality of the road surface (compared with e.g. the UK) certainly makes cycling in northern Spain more of a pleasure. For anyone considering taking a cycling holiday in Asturias here are some thoughts. Traffic levels on all out of town roads are low, whilst the quality of the roads is high (few potholes). Outdoor sports of all types are popular in this region which is known for adventure pastimes like canoeing, hiking, quad biking and potholing. Fishing is also popular. Do however be aware that the highway code is adhered to outside of the major tourist cities of Spain. This means that unlike in the UK you do have to drive in accordance with it and you do not cross lights on red, ride on footpaths or cycle 3 or 4 abreast. Doing any of these WILL see you pulled up by the police and they have little tolerance for crime and law breaking of any kind. Also, take out good personal insurance cover. If you are in an accident in northern Spain the general view is that roads are for cars and not bikes and you will get little sympathy and no payout, even if it is the fault of a motorist. Other than that, cycling by the rules will see you have a great experience, be welcomed by a very friendly and hospitable population, and have the opportunity to cycle on some great routes, both coastal and inland. You will also find lots of very affordable accommodation ranging from guest house like hotels to hostels. To find out more about the three cities of the region and also places like Covadonga and Cangas de Onis which the Vuelta route includes, use the indexes to the left and right and click on anything that interests you. If you have information concerning cycling in Asturias that you would like included on this site please contact us.